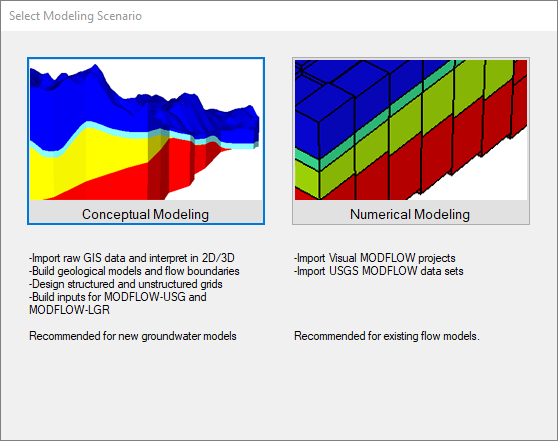 The following example walks through creating a numerical model with groundwater flow (using MODFLOW-2005) and basic contaminant transport (using MT3DMS). The exercise is based on the well-known Airport example from Visual MODFLOW Classic. Please Note: if you are unable to locate some supporting files for the tutorial, you may download these from the website. •Type in project name 'Airport Tutorial'. •The first step is to Define Modeling Objectives. •The Start Date of the model corresponds to the beginning of the simulation time period. •For this scenario, we will include contaminant transport in the model run. 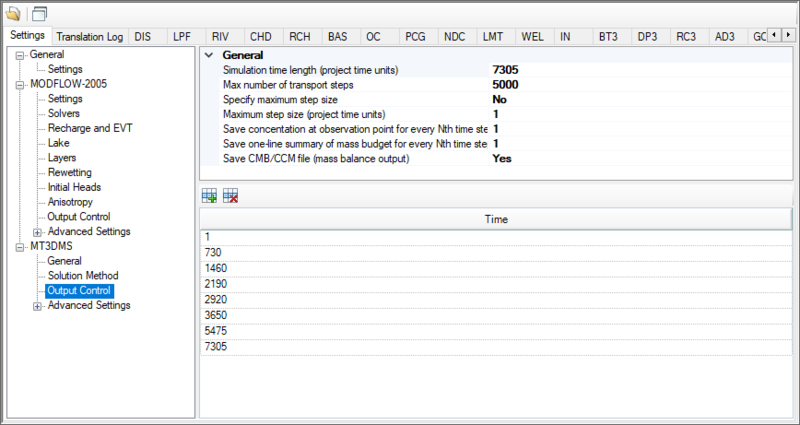 Click the check box beside 'Transport Active' (in the right hand side of the window, under Define Modeling Objectives. •For 'Retardation Model' select 'Linear isotherm (equilibrium-controlled)'. 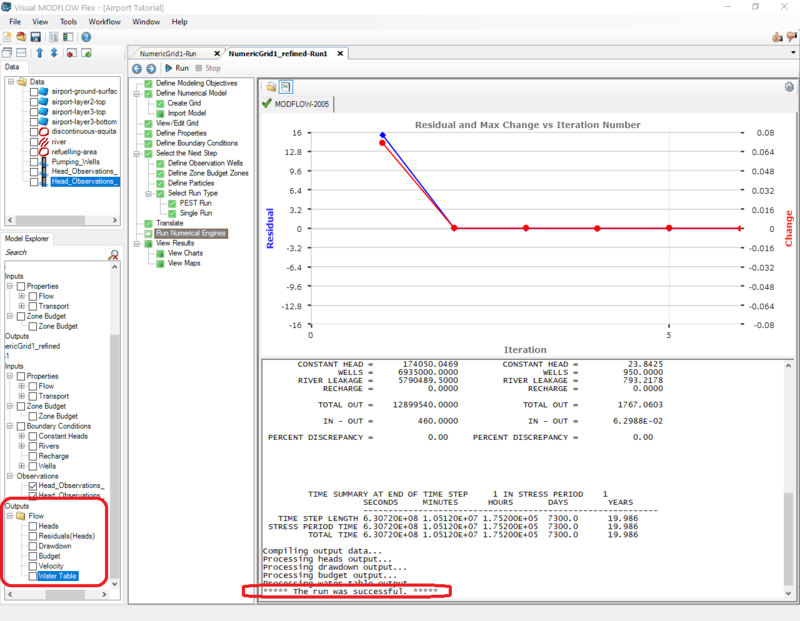 For this tutorial you will not be simulating any decay or degradation of the contaminant, so the default 'Reaction' setting of 'No kinetic reactions' will be fine. •You are now finished setting up the flow and transport objectives. Click [ ] (Next Step) to proceed. 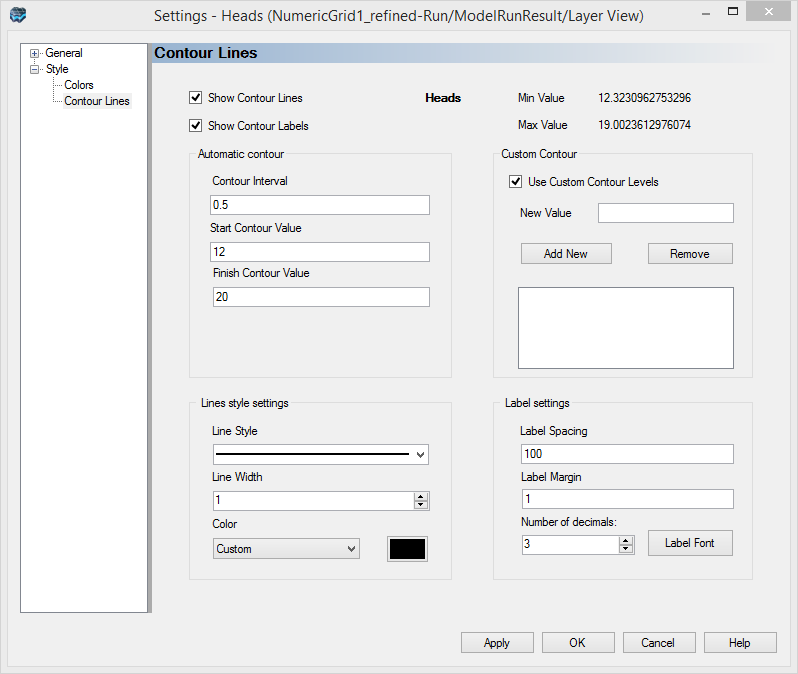 •The following 'Define Numerical Model' step will appear; at this step, you can import Visual MODFLOW Classic or MODFLOW data sets, or define a new empty grid. For this tutorial we will create a new grid. •In Visual MODFLOW Flex, you can define the elevations of the tops and bottom of the model layers. Or you can have varying layer elevations defined from Surface data objects. Surfaces could be from data objects you imported from Surfer (.GRD, ESRI .ASI, .DEM), or from Surfaces you have created through interpolating XYZ points. In this exercise, you will import 4 surfaces (from Surfer .GRD files), then use these to define the layer elevations. •For the Data Type, select 'Surface' from the drop-down list. •Click [Finish]. You should now see a new "airport-ground-surface" data object appear in the data tree, in the top left corner of the window. 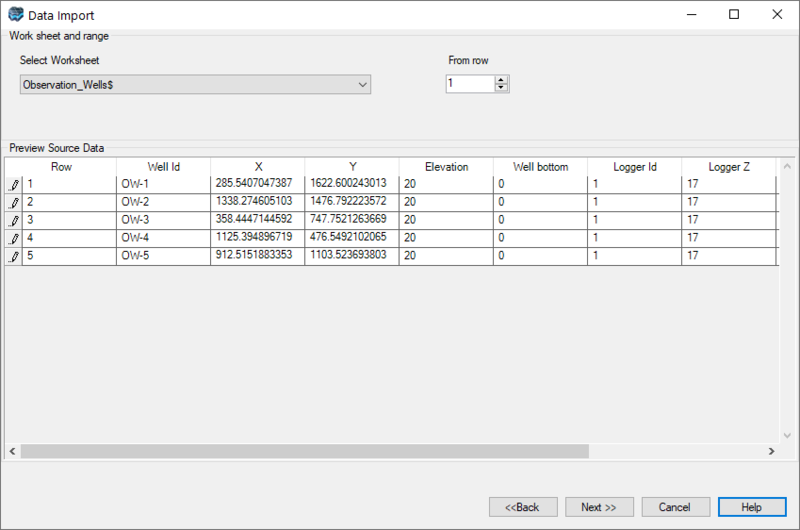 •When you are finished, you should see 4 Surface data objects in the data tree in the top left corner. 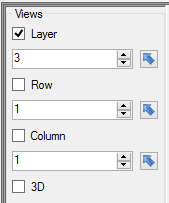 •Click on airport-ground-surface from the data object tree (it should become selected), then click on the topmost blue arrow [ ] beside 'Use Surface' in the Number of Layers table (in the row that starts "Layer 1 - Top". If you have done this correctly, the table should appear as shown below. •When you are finished, the table should appear as shown below. •You are finished defining the layer elevations. •Click on the [Create Grid] button (near the top right of the window) to create the grid. You will see the model tree will be generated on the left side of the window, and 'NumericGrid1' should appear as the last item. This section describes the steps necessary to refine the model grid in areas of interest, such as around the water supply wells, refueling area, and area of discontinuous aquitard. 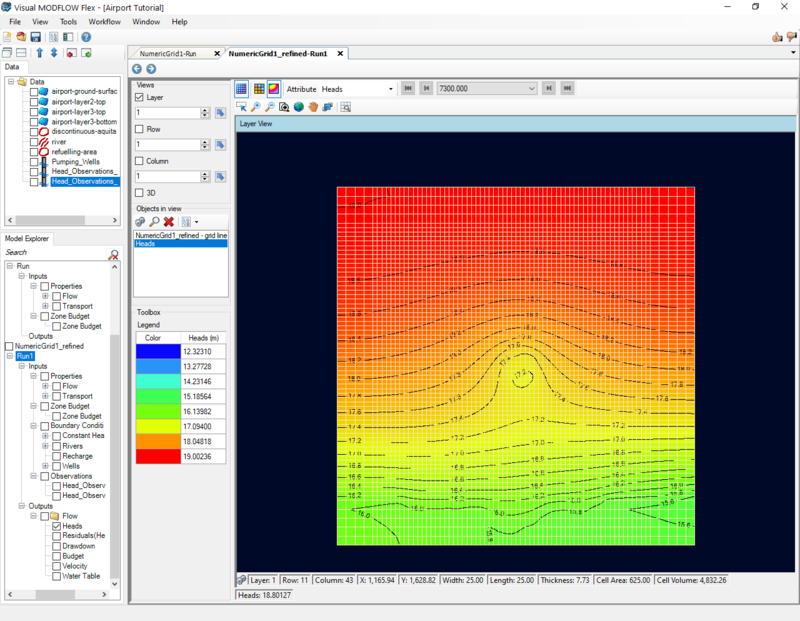 The reason for refining the grid is to get more detailed simulation results in areas of interest, or in zones where you anticipate steep hydraulic gradients. For example, if drawdown is occurring around the well, the water table will have a smoother surface if you use a finer grid spacing. Also, layer properties can be assigned more correctly on a finer grid. 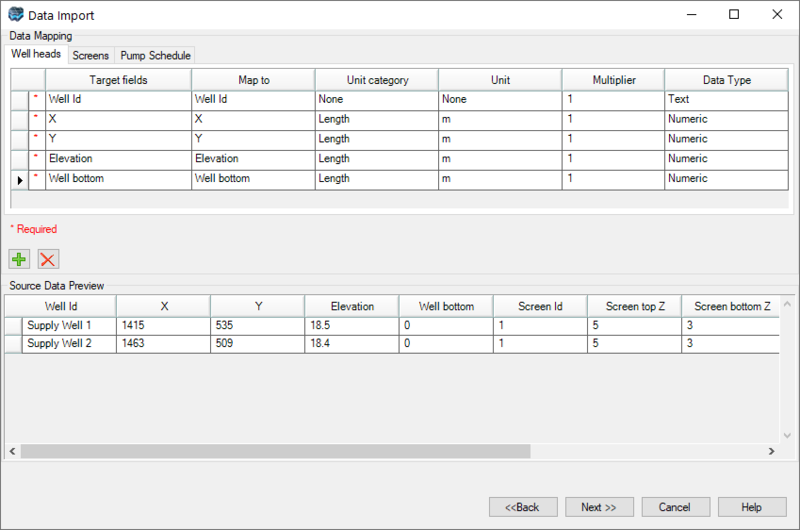 The grid refinement works by defining a starting row number, and ending row number, then a 'Refine by' factor; to help you define the limits of where the refinement should be applied, you can add data objects to this display, such as well locations, arial maps, shapefiles, etc. 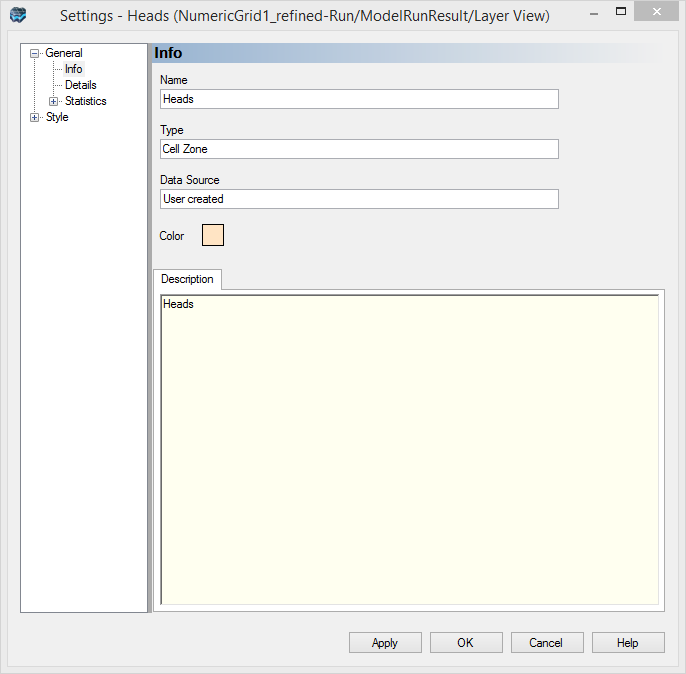 When you are using this feature with your own models, you will need to import these data object files before starting the 'Grid Refinement' step. •You will first start by refining the rows. •Enter '5' in the 'From' field, and enter '35' in the 'To' field. •Click on the [Apply grid edit] button. •Next, you will refine the columns. •At the top left of the window, select the [Edit Columns] radio button. •As before, Enter '5' in the 'From' field, and enter '35' in the 'To' field. 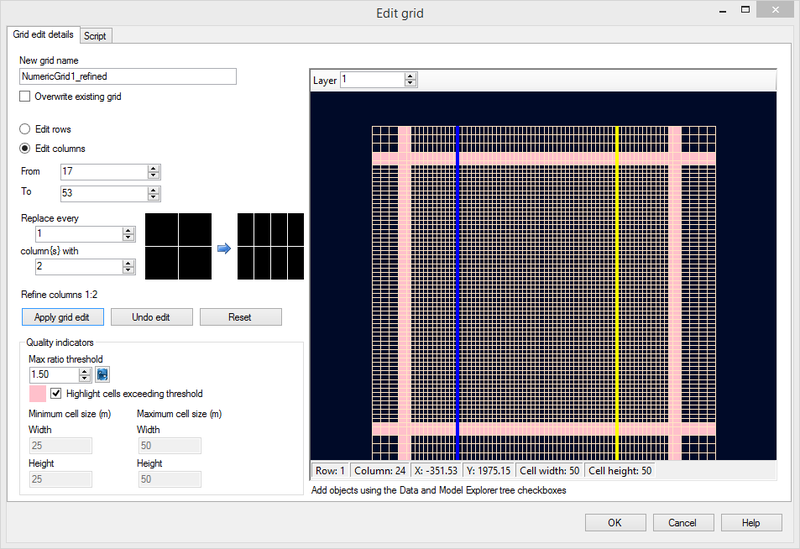 •You should now see coarse grid sizes around the edge of the model domain, and a more finer sized grid spacing in the middle of model (around the areas interest). This is shown below. The band of pink cells around the edges of the refinement indicate cells where the Max ratio threshold quality indicator (which is set by default to a cell step size of 1.50) has been exceeded. This can sometimes result in larger computational times and the potential for increased grid based dispersion. These areas can be further fractionally refined to improve the grid quality; in this exercise, we will leave the grid as-is and proceed to the next step. •Click on the [OK] button. •In the Model Explorer tree, right click on 'NumericGrid1_refined' and click [Convert to Numerical Model]. This opens a new workflow for the refined grid and adds a 'Run' node with related child nodes in the Model Explorer for the new refined grid. This will generate the model run folder in the Model tree, which includes input and output directories, and default flow and transport properties. •Dismiss the 'Conversion Progress' log by clicking [Close]. •Now is a good time to save the project. Click [File] then [Save Project] from the main menu. •In the next section, you will view the numerical grid that you just created. •Click on the Define Properties step or click the next button [ ] to proceed. This section will guide you through the steps necessary to design a model with layers of highly contrasting hydraulic conductivities. •Click [OK] to accept these values. Please Note: it may take a moment for Flex to process this change. In this three layer model, layer 1 represents the upper aquifer, and layer 3 represents the lower aquifer. Layer 2 represents the aquitard separating the upper and lower aquifers. For this example, we will use the previously assigned hydraulic conductivity values (Zone# 1) for model layers 1 and 3 (representing the aquifers) and assign different Conductivity values (i.e. a new Zone) for model layer 2 (representing the aquitard). Note that layer 1 is the top model layer. You are now viewing the second model layer, representing the aquitard. The next step in this tutorial is to assign a lower hydraulic conductivity value to the aquitard (layer 2). 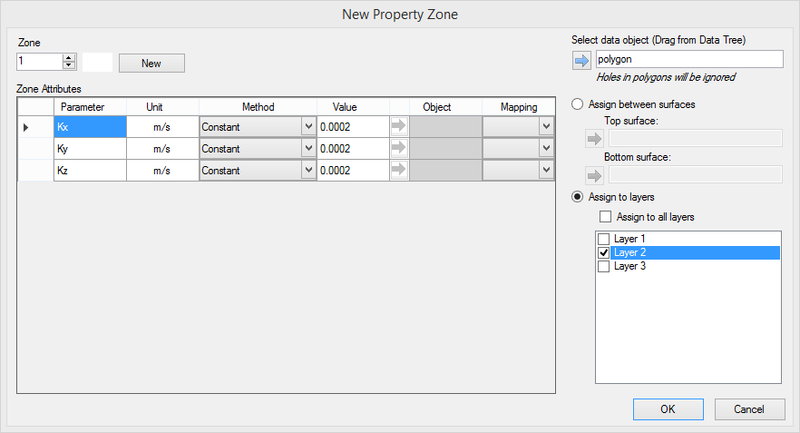 We can graphically assign the property values to the model grid cells. •Click [Assign] then [Entire Layer/Row/Column] from the toolbox. •Click on the [New] button at the top; this will create a new zone. • Click [OK] to accept these values. 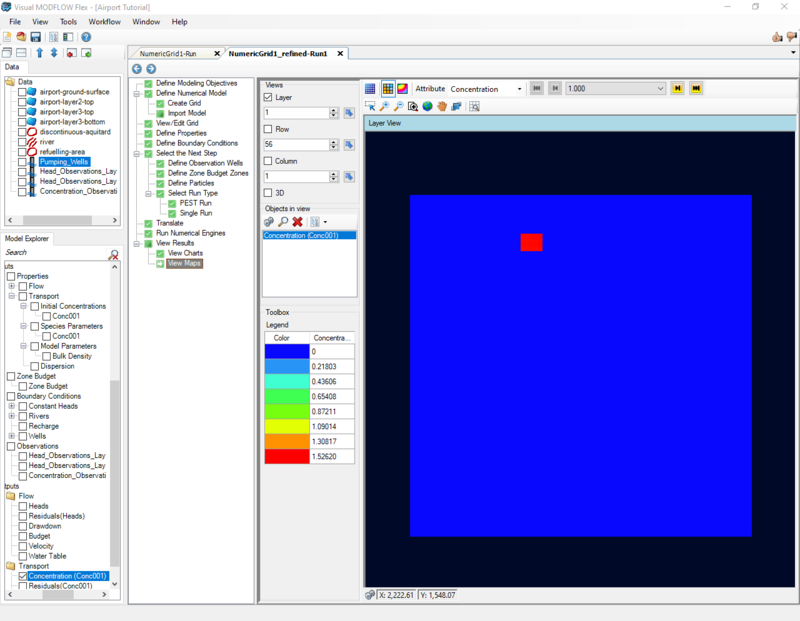 Once finished, the cells for Layer2 should change blue, which indicates these cells belong to Zone2; you can use the Legend under the toolbox as a guide, and also mouse over cells in the grid view, and note the values in the status bar. •For the Data Type, select Polygon from the drop-down list. •You should now see a new data object, 'discontinuous-aquitard' appear in the data tree, in the top left corner of the window. •Click on the box beside this data object in the tree . •The data object should now appear in the Layer View of the grid. •Zoom into this area (using the mouse wheel, or the Zoom in button on the toolbar). •Click [Assign] then [Using Data Object] from the toolbox. •Click [OK] to assign this group of cells to Zone1. This display should appear as shown below. •Enter 40 in the Exaggeration field, which is located in the toolbar directly above the Column view window. •Enter 37 for the Column number, as this will provide a cross-section through the region with the discontinuous aquitard. Take a moment to view the cross-section of the properties. You can also change the cross-section view (change the Column number up, down, or enter a new value), and use the zoom and pan tools on the Column view to improve the display. Note that you can repeat the same steps above for Rows, instead of Columns, in order to see cross-sections along the X-axis. •When you are finished, turn the Column View off, by removing the check-box beside [Column] under 'Views'. The next step is to define the flow boundaries for the model. In this example you will define constant heads along the north, in layer 1 and 3, and the Waterloo River along the southern edge in layer 1, and a constant head along the south in layer 3. The first Constant Head boundary condition will be for the upper unconfined aquifer along the northern boundary of the model domain. To do this you will use the [Assign]>[Polyline] tool. •First, you need to go back to Layer 1. Type '1' into the [Layer] field under 'Views' (or use the arrow buttons). •Next, ensure that 'Constant Head' is selected from the first dropdown menu under the 'Toolbox' section. •Under the 'Toolbox' section, click [Assign]>[Polyline]. Move the mouse pointer to the north-west corner of the grid (top-left grid cell) and left-click on this location to anchor the starting point of the line. Now move the mouse pointer to the north-east corner of the grid (top-right grid cell) and Right-Click on this location to indicate the end point of the line. Click 'Finish', then you should then see a small menu appear to 'Define Boundary Condition'. •Click [Next >>] to accept the default name. •Enter Starting Head (m) of 19 in the top row and hit F2 to propagate this value. •Enter Ending Head (m) of 19 in the top row and hit F2 to propagate this value. •Leave the default value of -1 for Conc001; this indicates that no contaminant mass will be assigned to these cells. Next you will assign a Constant Head boundary condition along the northern boundary for the lower confined aquifer. •Locate the [Layer] selection in the 'Views' section, and change this to '3'. •Ensure that 'Constant Head' is still selected from the first menu under the 'Toolbox' section. •Click [Assign]>[Polyline] from the toolbox. Move the mouse pointer to the north-west corner of the grid (top-left grid cell) and left-click on this location to anchor the starting point of the line. Now move the mouse pointer to the north-east corner of the grid (top-right grid cell) and right-click on this location to indicate the end point of the line. Click 'Finish' then you should then see a small menu appear 'Define Boundary Condition'. •Enter Starting Head (m) of '18' in the top row and hit F2 to propagate this value. •Enter Ending Head (m) of '18' in the top row and hit F2 to propagate this value. Next, assign the Constant Head boundary condition to the lower confined aquifer along the southern boundary of the model domain. •Click [Assign]>[Polyline] from the toolbox. Move the mouse pointer to the south-west corner of the grid (bottom-left grid cell) and click on this location to anchor the starting point of the line. Now move the mouse pointer to the south-east corner of the grid (bottom-right grid cell) and right-click on this location to indicate the end point of the line. Click 'Finish' then you should then see a small menu appear 'Define Boundary Condition'. •Enter Ending Head (m) of '16.5' in the top row and hit F2 to propagate this value. The following instructions describe how to assign a River boundary condition in the top layer of the model, along the southern edge of the model. •Select 'River' from the first dropdown menu in the 'Toolbox' section. •Click [Assign]>[Using Data Object] from the toolbox. 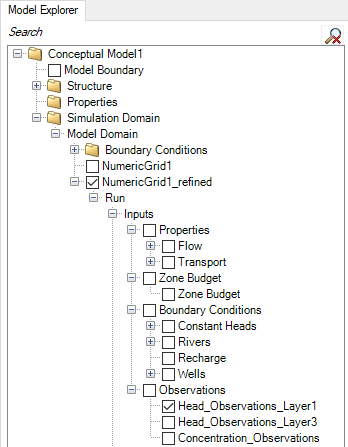 Use the [ ] button to add the river data object to the geometry section of the 'Define Boundary Condition' dialog. Hit [OK] to the message that the extents will be clipped to the model domain. •Click [Next>>] to accept the default name. •The 'Define Boundary Condition' window will appear as shown below. Traditionally, the River boundary condition has required a value for the Conductance of the riverbed. However, the Conductance value for each grid cell depends on the length and width of the river as it passes through each grid cell. 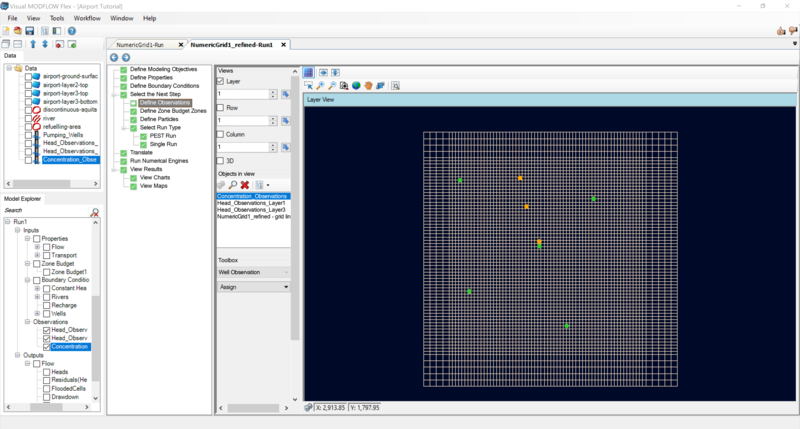 Therefore, in a model such as this, with different sizes of grid cells, the Conductance value will change depending on the size of the grid cell. 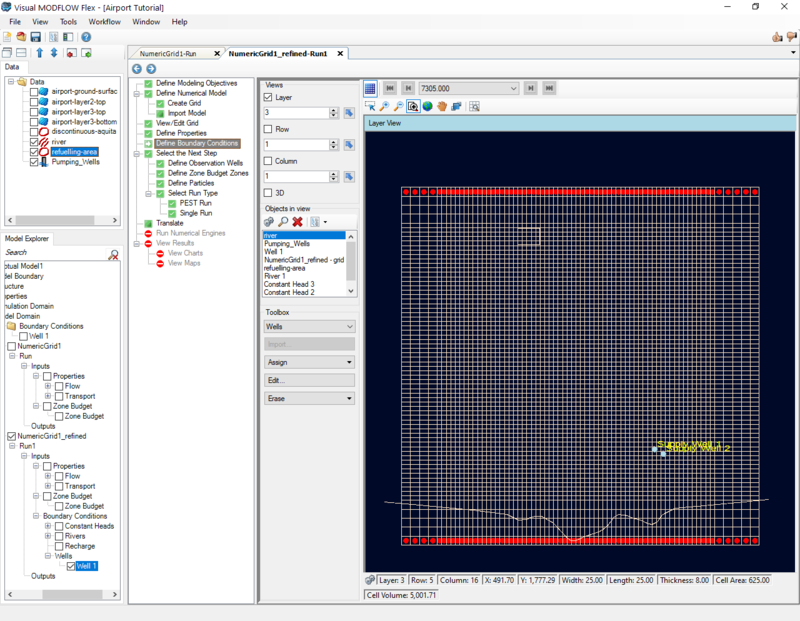 In order to accommodate this type of scenario, Visual MODFLOW allows you to enter the actual physical dimensions of the river at the Start point and End point of the line, and then calculates the appropriate Conductance value for each grid cell according to the standard formula. 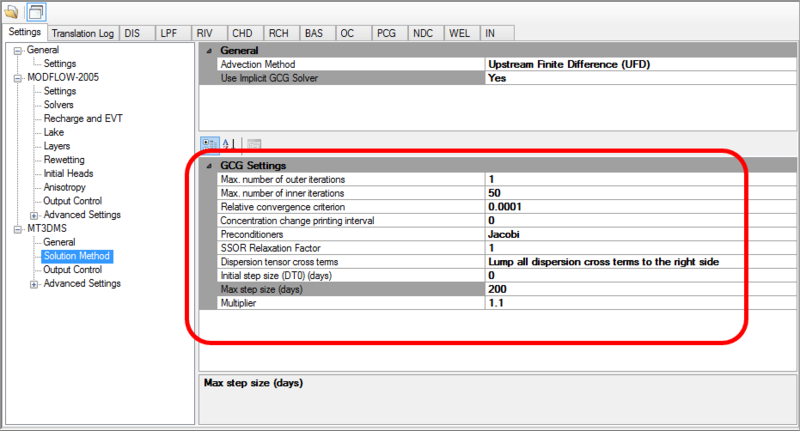 Select the first row in the define Boundary Condition dialog and notice Flex has highlighted in yellow the corresponding river cell (lower left corner of the river). This dialog is interactive; you can select cells in the dialog or viewer/grid window to see how boundary values are currently assigned. 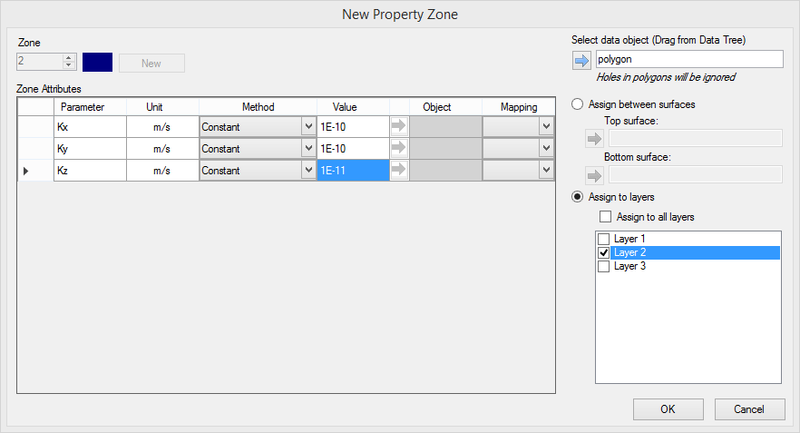 •In the top row of the boundary assignment dialog enter the following values for the start point. •Now you will define the values for the End Point of the river. •Scroll to the bottom row in the Define Boundary Condition dialog and click in it. 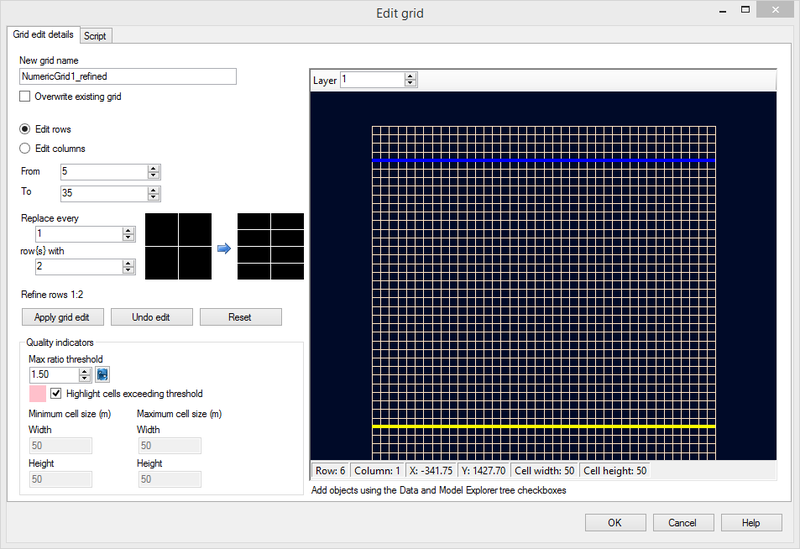 Notice the river end cell is now highlighted yellow in the grid view. •Holding the CTRL key on your keyboard, click to also highlight the last (end) row. •Now click the interpolate button [ ]. The intermediate rows should now populate with interpolated values. •First, you need ensure you are viewing Layer 1. 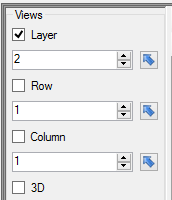 Type '1' into the [Layer] field under 'Views' (or use the arrow buttons). •Select 'Recharge' from the list of boundary conditions in the toolbox. •Click [Assign]>[Entire Layer] from the toolbox. The 'Define Boundary Condition' dialog will appear. •Enter 100 in the 'Recharge (mm/yr)' column and hit F2 to propagate this value to all rows. •Leave the default value of -1 for Conc001; this indicates that no contaminant mass will be assigned to the recharge flux. •Enter 0.1 in the 'Ponding (m)' column and hit F2 to propagate this value to all rows, as shown below. •Click [Finish]. All cells in the top layer will be assigned a recharge rate of 100 (mm/yr). The recharge boundary will be displayed as white dots. Now you will assign a higher recharge value at the Refuelling Area where jet fuel has been spilled on a daily basis. First you need to import a polygon shapefile that delineates this area. •For the Data Type, select 'Polygon' from the drop-down list. •Click [Finish]. 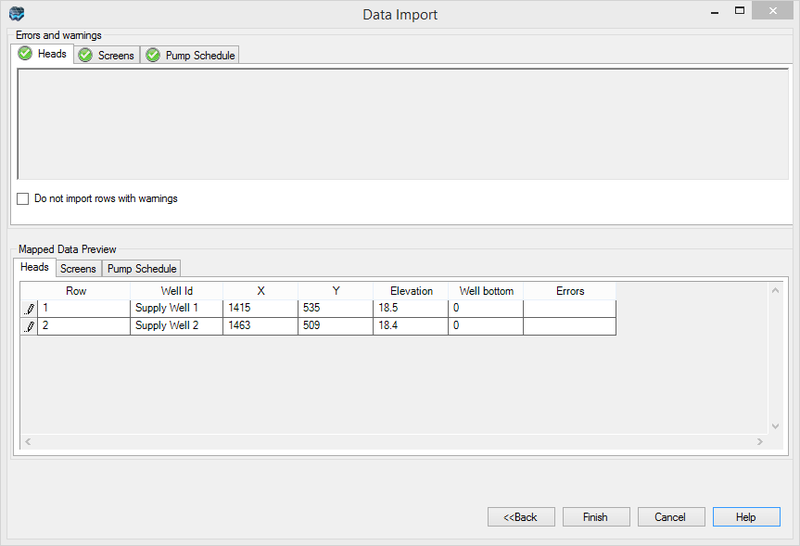 You should now see a new data object, 'refuelling-area' appear in the data tree, in the top left corner of the window. •Click on the box beside this data object in the tree . The data object should now appear in the Layer View of the grid (it is located in the top middle of the site). Please Note: you may need to uncheck 'Recharge' from the Model Explorer tree to make the view less cluttered. •Click [Assign]>[Using Data Object...] from the toolbox. A 'Define Boundary Condition' window will appear. Use the [ ] button to add the 'refuelling-area' object to the geometry section of the dialog. •Enter 250 in the 'Recharge (mm/yr)' column and hit F2 to propagate this value to all rows. •Enter 0.1 in the 'Ponding (m)' column and hit F2 to propagate this value to all rows. •Notice that Conc001 has a default of -1 indicating that there is no defined mass flux assigned to this boundary condition. You will modify this later on in the Transport section of the tutorial. •Click [Database] to see the recharge zones you created, and their corresponding values. •Now is a good time to save the project. Click [File]>[Save Project] from the main menu. 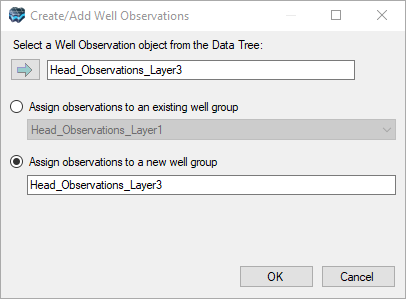 To generate a pumping well boundary condition, you can either add them one at a time through the user interface, or use a wells data object for this model, you will begin by importing a wells data object. •Click [File]>[Import Data...] from the main menu. •Select 'Well' as the data type. •Browse to your Public "My Documents" folder, then 'VMODFlex\Tutorials\Airport\suppfiles\Pumping_Wells.xls' file. •[Next>>]. 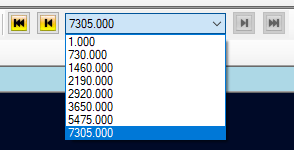 The next window will show a preview of the data to be imported. •VMOD Flex provides you with various options to import well data. In this window, you must select to import the well heads, screens, and pumping schedules. •Select the [Well heads with the following data] check box. •Select the [Pumping Schedule] check box. •[Next>>] to accept the default Coordinate System. 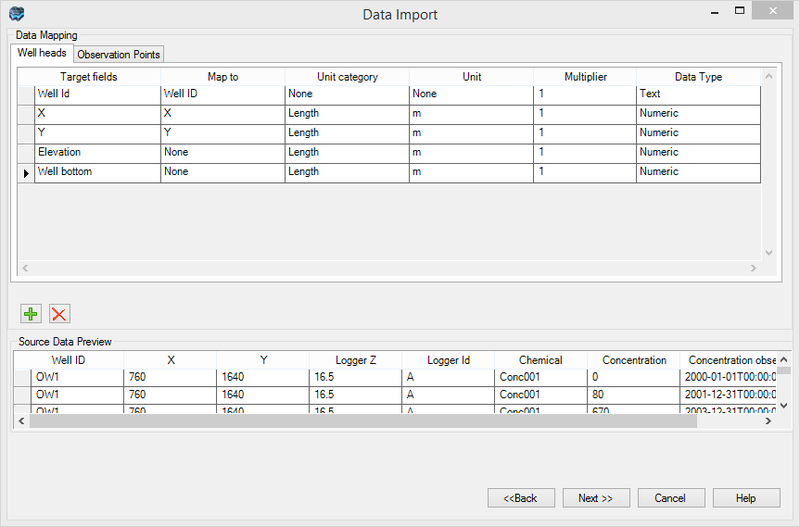 When working with your own pumping well data for your models, you can use this Excel file as a template; by having all the fields automatically mapped this reduces the effort required during the import process, and minimizes the source of errors. •You should see a series of green check marks next to the 'Heads', 'Screens' and 'Pump Schedule' tabs indicating that there were no import errors. The 'Pumping_Wells' will now appear as a new data object in the Data tree. •At the Define Boundary Conditions step in the workflow, under Toolbox, choose 'Wells' from the first dropdown menu listing available boundary condition types. •Click the [Assign]>[Using Data Object] button. A 'Create Well Boundary Condition' window will appear. 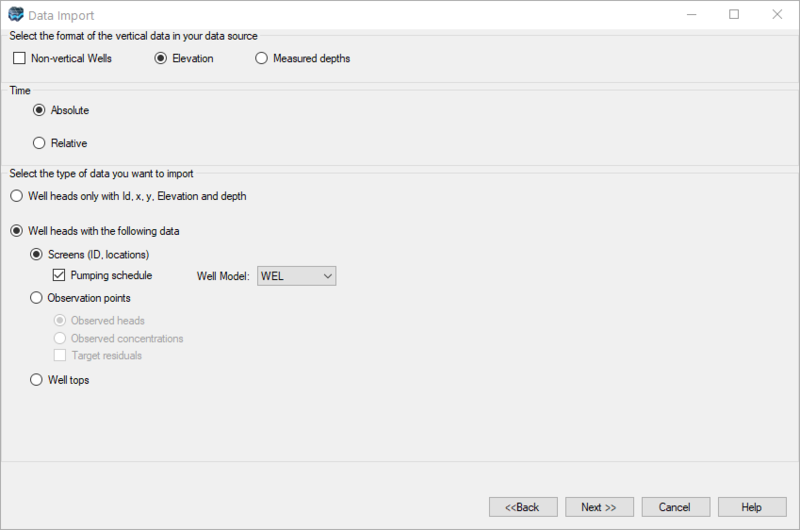 •Select (highlight) the 'Pumping_Wells' data object from the Data Tree (you may need to move the Pumping Wells Boundary Condition dialog to the right in order to see this). •Click [ ] button located in the middle of the 'Create Well Boundary Condition' window, under 'Select Raw Wells Data Object or Drag & Drop'. Once completed, your display should appear as shown below. •Click [OK]. The pumping wells have now be added to the numerical model. You should see a new node appear on the Model Explorer, under 'NumericGrid1_refined/Run/Inputs/Boundary Conditions/Wells'. In order to see these wells, you need to turn off the Recharge coverage and change to layer 3. •Change to Layer 3 (as explained earlier). •Also, you may need to zoom out to the full grid extents, by selecting the [ ] (Zoom to Full Extents) button on the toolbar above the grid. •You should see the two points representing the wells, located in the lower right corner of the model domain, as shown in the following figure. •[…] to choose the source file. •Browse to your Public 'My Documents' folder, then 'VMODFlex\Tutorials\Airport\suppfiles\Head_Observations_Layer1.xls' file. A preview window will appear displaying the source data. •[Next>>]. VMOD Flex provides you with various options to import well data. •Ensure you have the options selected as shown below. 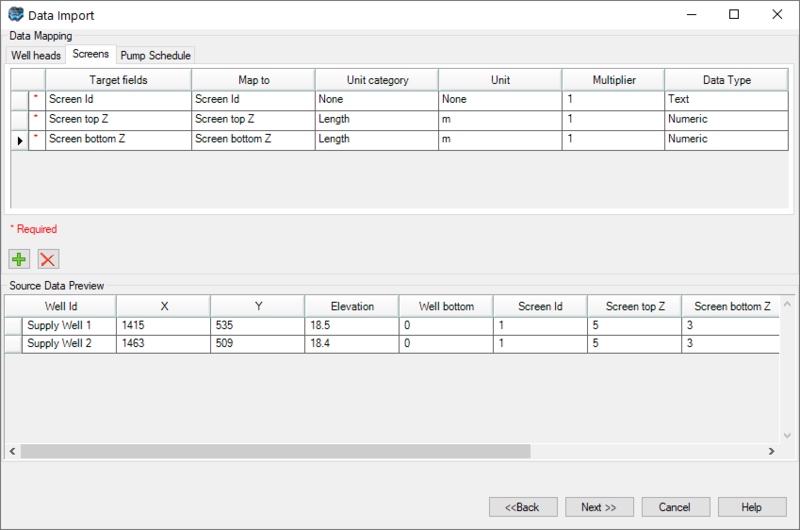 In this screen, you need to map the fields from the spreadsheet to required fields in the Wells Import utility. 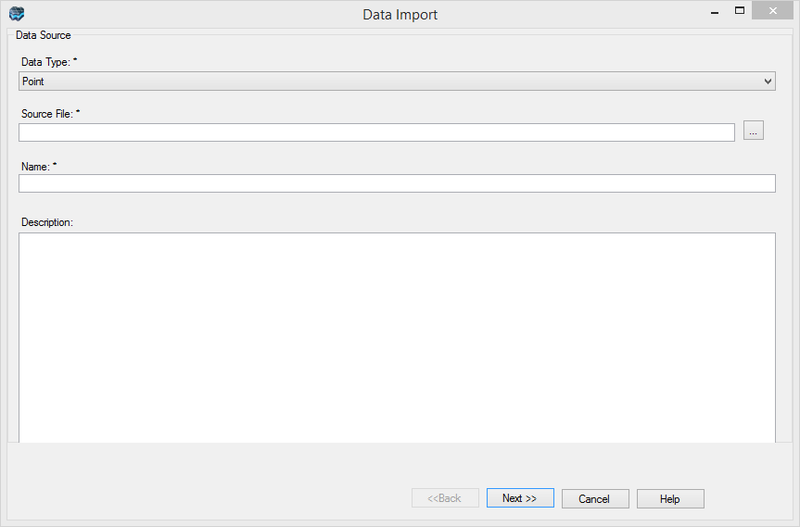 The Data Import preview will appear, indicating if there were any errors with the file import. This file should import with no errors. The 'Heads_Observations_Layer1' will now appear as a new data object in the Data Tree. Take a moment and visualize this in the 3D Viewer. 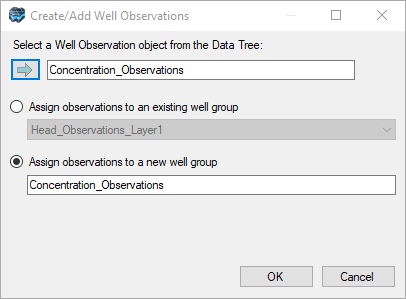 Next you need to add these raw observation wells as observation points for the numerical model. •Be sure that the 'Head_Observations' data object is selected in the Data Tree. •Click on the [ ] button located under the toolbox in the 'Define Observation Wells' workflow step. •The observation wells will be added to the display and the numerical model tree. You should see several green points in the model domain that represent the locations where head measurements were taken. (in this example, all the head observations are in layer 1). 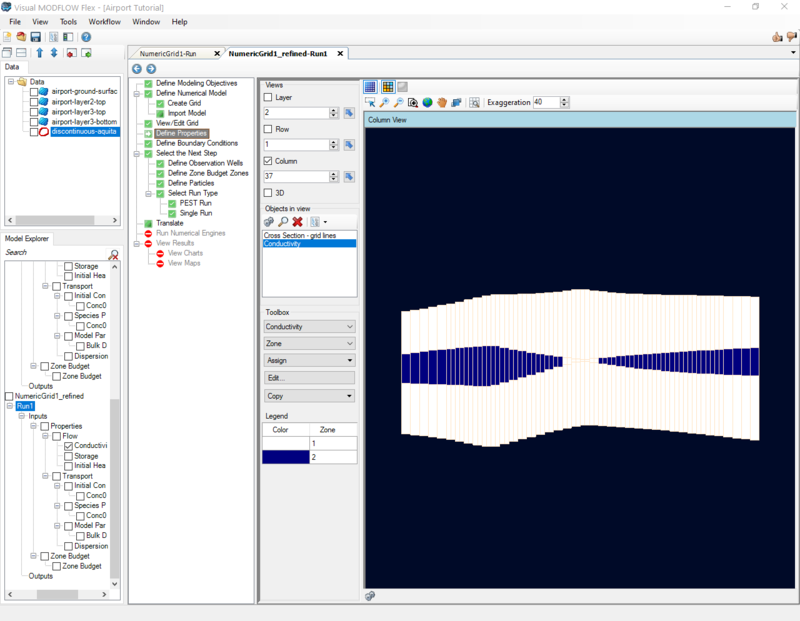 •From the 'Single Run' step in the workflow, you will see 'USGS MODFLOW 2005 from WH' is selected along with 'MT3DMS' as the transport engine. •For the first run, we will run the flow solution only, without transport. At the Translate step you have the option to adjust the various parameters and flags for the MODFLOW packages and run time settings. 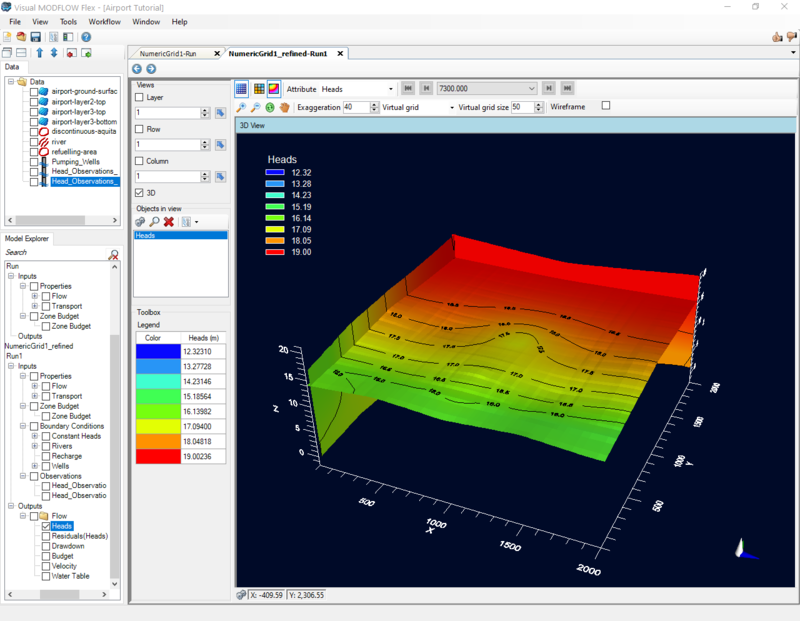 Available options include: 'Settings' (General), 'Settings' (MODFLOW-2005), 'Solvers', 'Recharge and Evapotranspiration', 'Lake', 'Layers', 'Rewetting', 'Initial Heads', 'Anisotropy', 'Output Control' and 'Advanced Settings'. •Enter 7300 for 'Steady-State Simulation Time' (in the grid in the main window). •Click [ ] to create the MODFLOW-2005 packages. Check the log to confirm the translation has finished. •Click the [ ] button to run MODFLOW-2005. The following 'View Results' window will then appear; you have the option to View Maps or View Charts. We will start by viewing maps of heads. •Click [View Maps] button to proceed. You will then see color shading of the calculated heads, in layer view. You can press F4 to hide the workflow, and bring it back again at any time by pressing F4 again. •If you do not like the default contour interval or line color, you can customize the contour map settings. •From the Settings tree on the left, select 'Style' followed by 'Contour Lines'. This will expand the settings window and give you access to the Contour Line settings. •When you are finished, click [OK]. •This will apply the changes to the head contours in your current view. All of the Settings windows have an [Apply] button in the lower right corner. This means you can apply the adjusted changes and see the impact in the current 2D or 3D view before you close the window. This makes it easier to obtain the desired display without having to open and close this window several consecutive times. •You can also display heads along a row, along a column, or in 3D using the same tools that you used earlier. •Take a moment to view the heads in other layers/rows/columns. •First, ensure you are viewing 'Layer 3'. This layer contains the pumping well, and should contain a significant flow field in that region. You should be able to see larger velocity vectors in the bottom-right corner of the model, in the vicinity of the pumping wells. These indicate that groundwater flows are significantly faster in this area. You may also notice a 'ring' approximately in the middle of the model. This indicates that there is significant flow perpendicular to layer 3 in this zone. Since the ring is blue, that would indicate flow in the negative Z direction, or down through layer 2 and into layer 3. 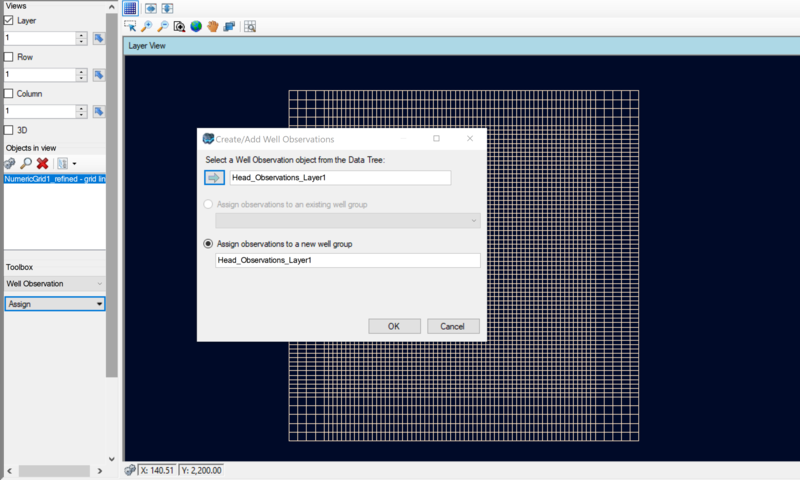 It's very easy to review calibration charts in Visual MODFLOW Flex whenever observation data has been applied to your model. 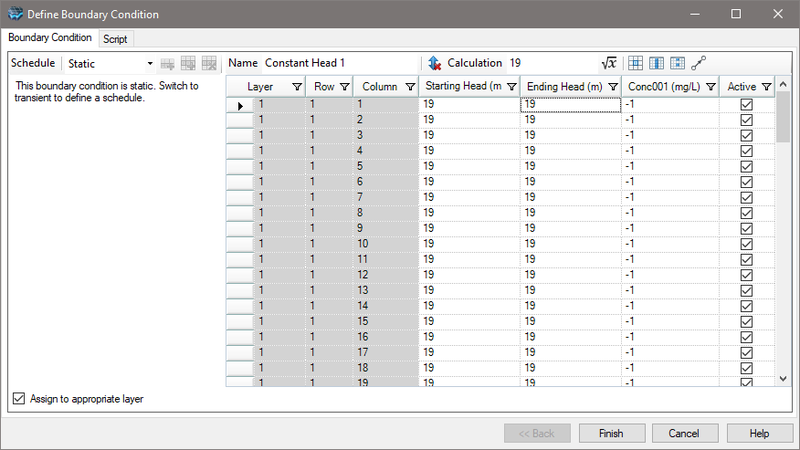 Since we have applied observed head values in a previous step we can now proceed to the 'View Charts' workflow step to view the automatically generated calibration charts. •Click on 'View Charts' from the workflow tree, and the chart window will appear. •In the side toolbar, turn on the check box beside 'All Times' and 'All Obs'. •Click [Apply] and the chart should appear as shown below. 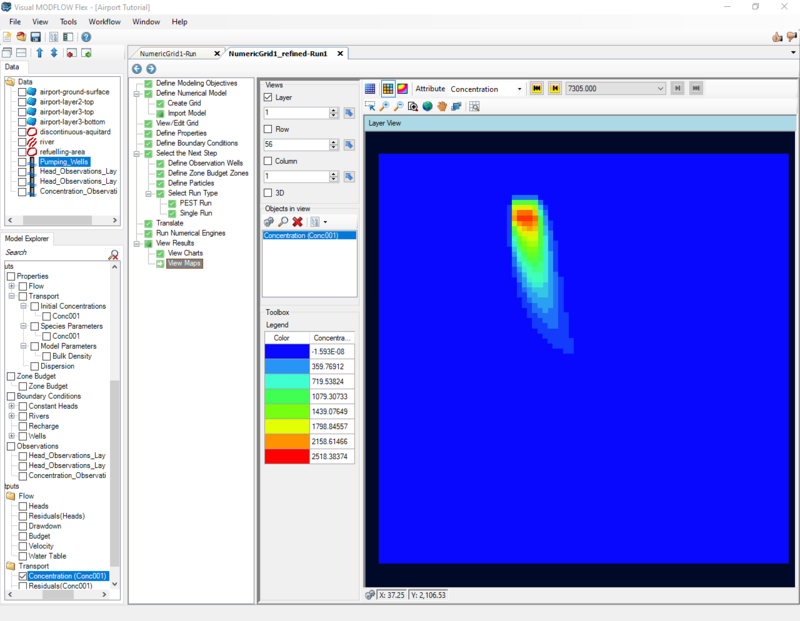 As you can see from the image above, Visual MODFLOW Flex supports a number of methods for selecting different wells. It will always be possible to turn on/off wells in particular layers. Visual MODFLOW Flex also supports observation 'groups'. In this example, our two observation groups have been delineated based on the layer in which they reside. However, you can group observation wells any way you like. 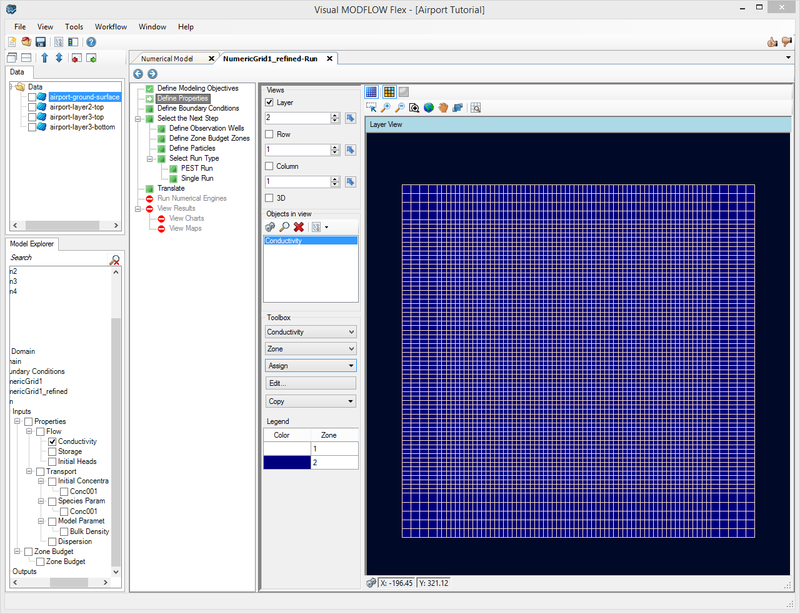 In the next section of the tutorial, you will define the inputs for the transport run (properties and boundary conditions), then run MT3MDS along with MODFLOW-2005, and view and interpret the results. The following section outlines the steps necessary to complete a simplified transport model. Similar to a groundwater flow model, a contaminant transport model requires properties (including initial concentrations), boundary conditions (sinks/sources), and observations in order to calibrate the transport model run against observed field conditions. These steps are described in the following sections. In this example, the only reaction that will be simulated is linear equilibrium adsorption of a single dissolved species (the Jet fuel compound JP-4). However, depending on the complexity of the problem you are dealing with, your model may have several different zones with different sorptive and reactive properties (distribution coefficients, decay coefficients and yield coefficients) for each dissolved species in the model. In Visual MODFLOW Flex, the properties and processes for the transport model are assigned using the same types of graphical tools as you used for assigning the flow model properties. 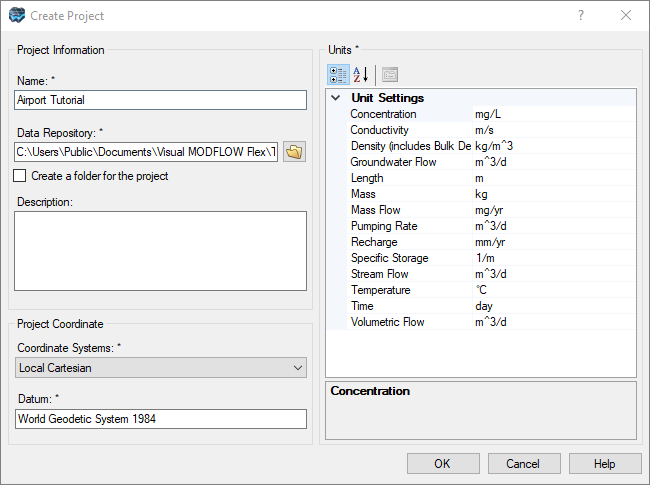 For this tutorial you will not need to modify the Distribution Coefficient value you defined during the transport model setup, but you may examine the sorption parameter values as follows. •From the workflow tree, click on [Define Properties] to go back to this step. •Under the toolbox, choose [Species Parameter Conc001] from the first menu. •Click on the [Zone] button and change it to [Kd]. 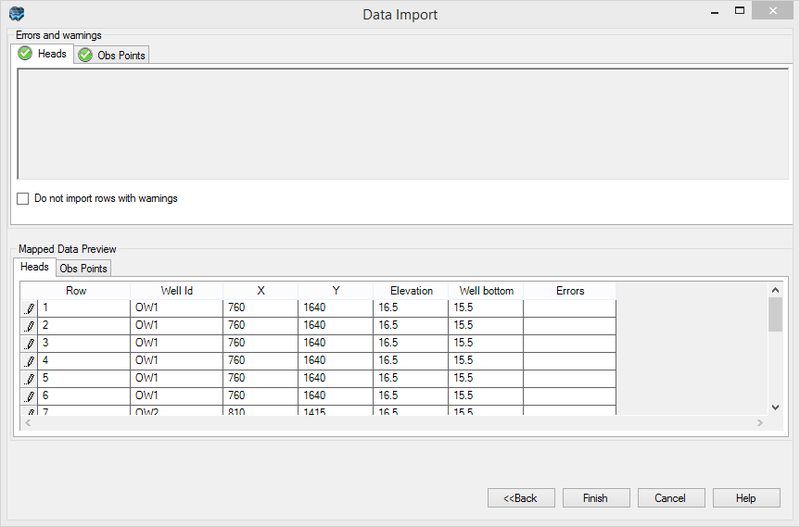 The Parameters Database window will appear as shown below. The default distribution coefficient (Kd = 1.0e-7 L/mg) was specified during the setup of the transport numeric engine. If this is not so (e.g. if you did not enter this value when creating the project), enter this now using the [Edit] button. •With 'Species Parameter Conc001' and 'Kd' selected in the toolbox, click the [Edit] button. •This will open the 'Edit property' window. •Under the 'Kd' column enter 1E-07 in the first row and click F2 to propagate this value to the rest of the column. The Kd values for each zone can be modified to accommodate heterogeneous soil properties and reactions throughout the model domain. However, for this example you will keep it simple and use a uniform Distribution Coefficient for each layer of the model. The next step is to define the dispersion properties for the model. 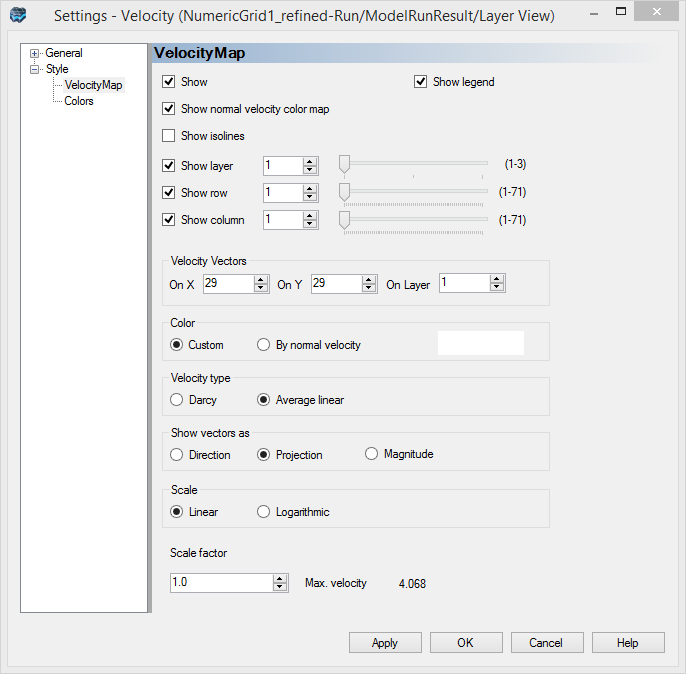 Visual MODFLOW Flex automatically assigns a set of default values for each of the dispersivity variables. The following table summarizes these values. It is possible to assign alternate values for the longitudinal dispersivity by using the [Assign] option buttons from the toolbox. However, for this example, you will use a uniform dispersion value for the entire model domain. In order to modify the horizontal or vertical dispersivity ratios and/or the molecular diffusion values you need to load the Layer Options. In this section you will define the location and concentration of the contaminant source. The source of contamination will be designated at the refueling area as a Recharge Concentration that serves as a source of contamination to infiltrating precipitation. 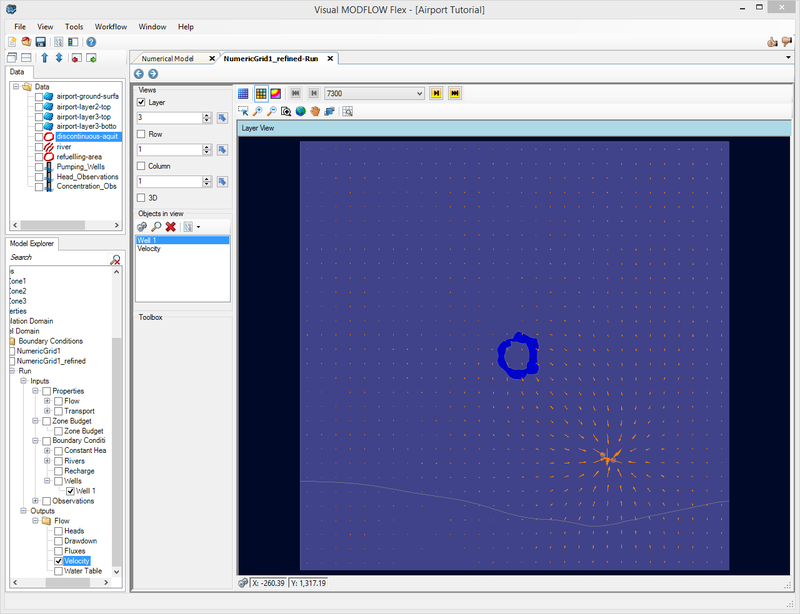 If you are used to working with Visual MODFLOW Classic, you will notice a difference in how transport boundary conditions are handled in Visual MODFLOW Flex. In VMOD Classic, transport boundary conditions were defined separately from the flow boundary conditions using the types Constant Concentration, Recharge Concentration, Evapotranspiration Concentration, and Point Source. In Visual MODFLOW Flex, the sink/source parameters for transport models (which are time and species concentrations) are defined as part of flow boundary conditions, which is a more natural representation. This means you do not define separate cell geometries for transport boundaries, you simply define species concentrations while defining the flow boundary conditions, where required. Constant Concentration is an exception to this rule, since it does not need to coincide with a prescribed flux, you will still see a "Constant Concentration" boundary condition type, allowing you to define the geometry (cells) and parameters (time and species concentrations) for this Boundary Condition type. When you defined the flow model, you created a separate recharge zone that covers the refuelling area. Now you will add a defined species concentration to this recharge flux. •Ensure you are viewing the 'Define Boundary Condition' workflow step. •Check to ensure that you are viewing Layer 1. 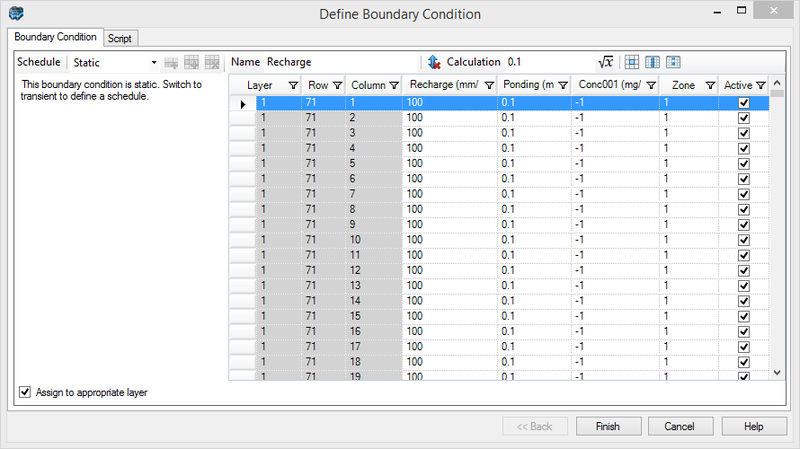 •Select 'Recharge' from the list of available boundary conditions under the toolbox. •You will recall there were two recharge zones created for the flow model: background recharge of 100 mm/yr covering the entire model top, and a small area over the refueling area with a higher recharge rate of 250 mm/yr. The mass of contaminants will be assigned only to this smaller recharge zone. •If not already visible, you must make the Recharge zones visible. 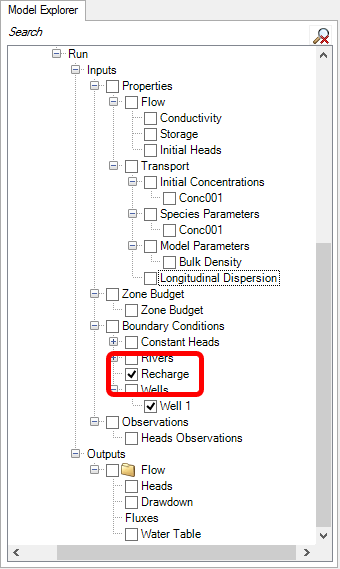 In the Model Explorer, locate the 'Recharge' node, under 'Inputs'>'Boundary Conditions', as shown below. •Click on the box beside 'Recharge' in the tree . •Under the 'Toolbox' section, click the [Database] button and the following window will appear. When the recharge zones were previously created, the values for the chemical species (Conc001) were left as undefined, indicated by -1. You will modify this for the smaller recharge area. •Enter 5000 for Conc001 (thereby replacing the -1 value). The final step before running the transport simulation is to add the three observation wells to the model to monitor the jet fuel concentrations at selected locations down-gradient of the refueling area. The first observation well (OW1) was installed immediately down-gradient of the refuelling area shortly after the refuelling operation started. The other two observation wells (OW2 and OW3) were installed two years later when elevated JP-4 concentrations were observed at the first well (OW1). You will import the concentration observations from an Excel file. •Browse to your Public 'My Documents' folder, then 'VMODFlex\Tutorials\Airport\suppfiles\Concentration_Observations.xls' file. 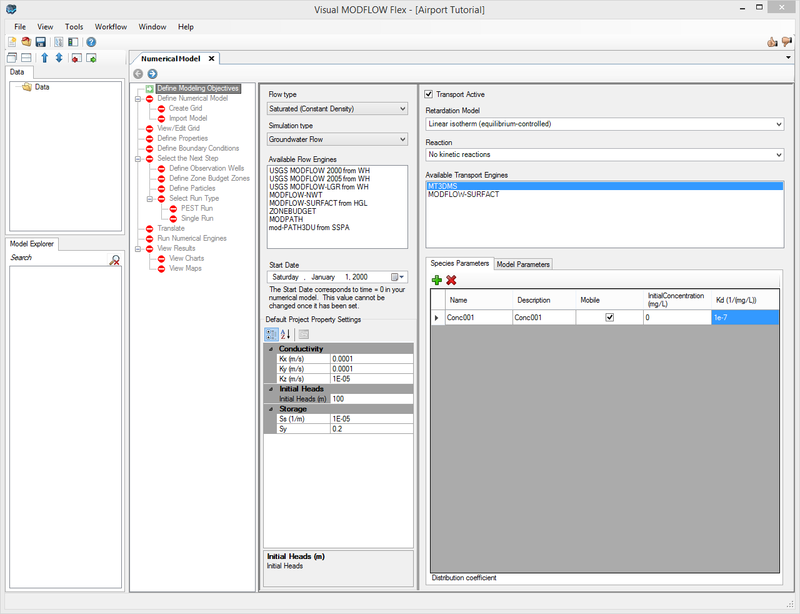 •VMOD Flex provides you with various options to import well data. 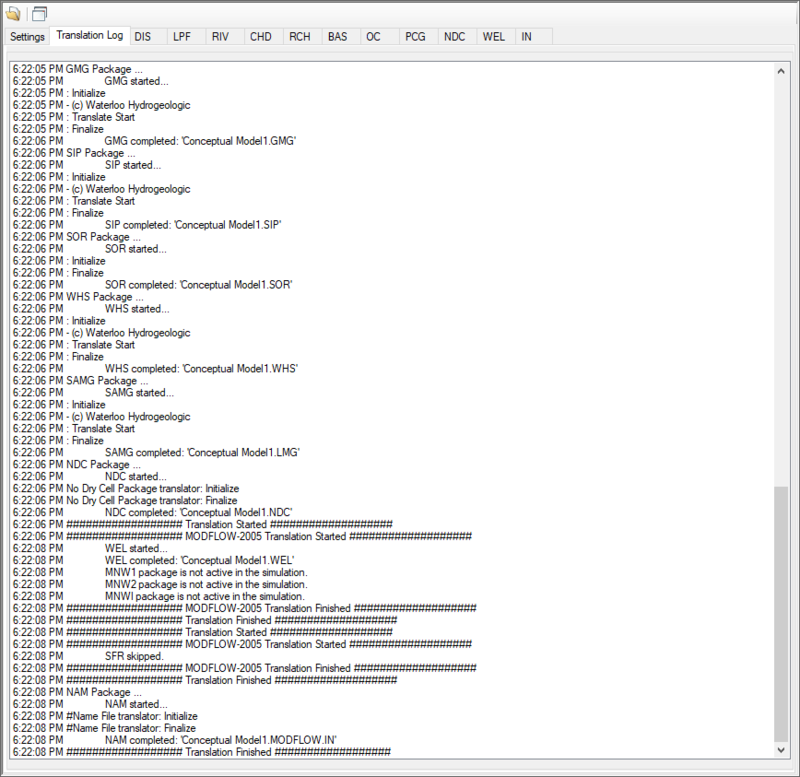 The 'Concentration_Observations' will now appear as a new data object in the Data tree, as shown below. 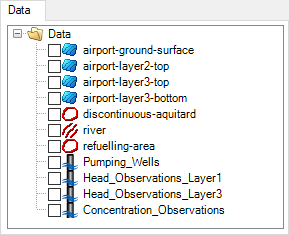 Now you need to add these raw observation wells as observation points for the numerical model. •Ensure that you are on the 'Define Observation Wells' step in the numerical modeling workflow. •Click the [ ] button located under the toolbox in the 'Define Observation Wells' workflow step. 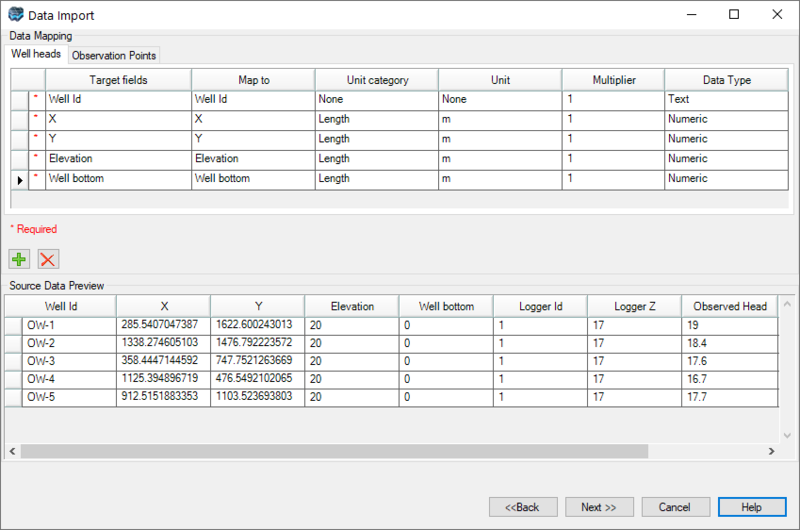 •Locate 'Concentration Observations', and click on the box beside this data object in the Model Explorer . •You should see several orange points in the model domain that represent the locations where head measurements were taken. •At the 'Single Run' step, be sure to include MT3DMS in the engine run; place a check box beside this engine in the list. 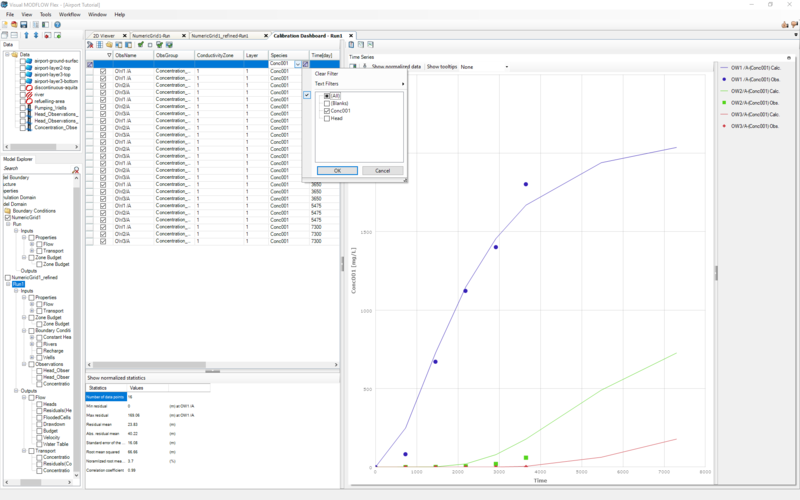 This section will guide you through the selection of the advection method, solver settings, and output times that you will use to obtain the solution and results for the contaminant transport model. •Expand the 'MT3DMS' item under the Translation settings, and select [Solution Method]. A Solution Method settings window will appear. For this model run you will be using the Upstream Finite Difference solution method with the Implicit GCG Solver. The Upstream Finite Difference method provides a stable solution to the contaminant transport model in a relatively short period of time. The GCG solver uses an implicit approach to solving the finite difference equations, and is usually much faster than the explicit solution method. •Click the button in the 'Use Implicit GCG Solver' option and select [Yes]. •Though the Upstream Finite Difference method and the Implicit GCG Solver are computationally efficient, the tutorial simulation tracks contaminant transport over a 20 year period. In order to speed up the modeling process, you will use a nonlinear time step. Type the following information in the fields at the bottom of the window. 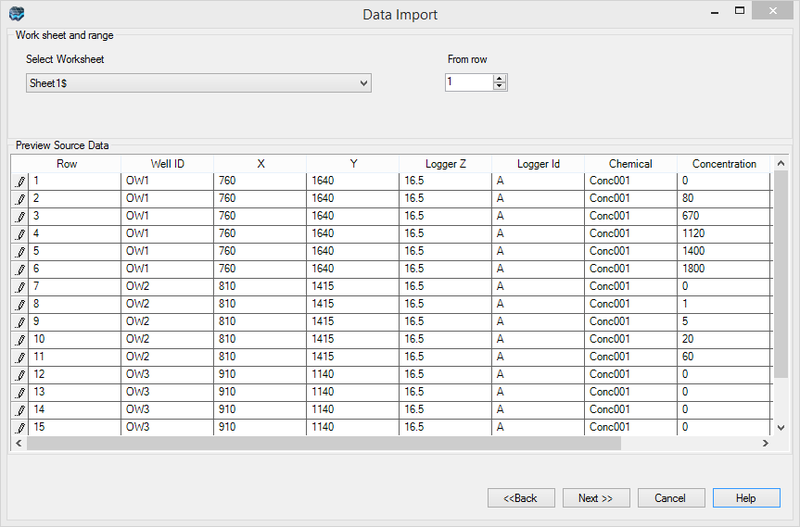 Next, you will define the output times at which you would like to see the contaminant transport modeling results. •Under the 'MT3DMS' section in the Translation settings, select [Output Control]. The Translation settings will update as shown below. 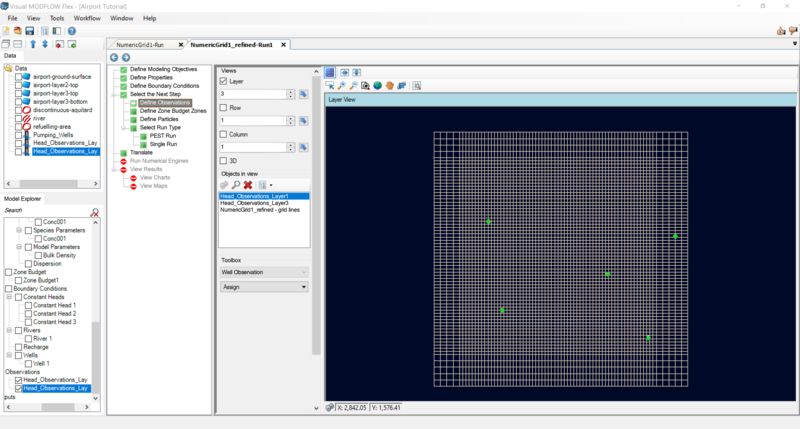 •For this tutorial you will define specified times at which you would like to see the transport simulation results. •Click the [ ] [Add Row] button; repeat this 7 more times. •Enter the following output times in the grid. 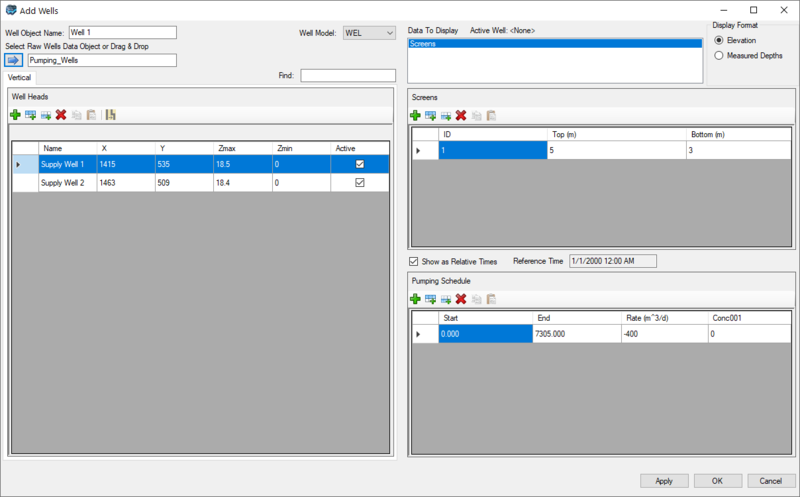 •You are now ready to translate the inputs into the MT3DMS packages. •Click the [ ] button to run MODFLOW-2005 and MT3DMS. •The MODFLOW model run should complete in a few seconds; the MT3DMS run should also complete in 5-10 seconds. •Once finished, you should see "***** The run was successful. *****" in the engine progress window. •In addition, you will see several items will be added to the model tree under 'Outputs'. You should also see 'Concentrations' added to the model output tree under 'Output/Transport'. •By default, the Heads will be shown in the Maps view. 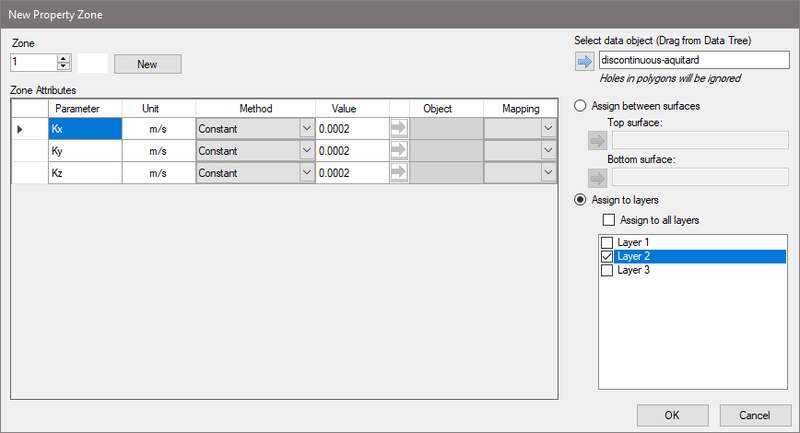 In order to see the 'Concentrations', you need to turn off 'Heads' from the model explorer and turn on 'Concentrations'. •Locate the 'Output' node on the model tree. •The concentration contours will be plotted for the first transport output time (in this case the first transport output time is 1 day). •In order to see the concentration results at the other output times, you need to advance the output time. Click on the time step buttons located on the toolbar above the 'Layer View', as shown below. Alternately, you can expand the list of output times, and navigate directly to the desired output time. •Locate the data object "discontinuous-aquitard" from the tree, and turn it on. It should appear in the layer view. Take a moment to navigate through the other layers, to see the calculated concentrations. 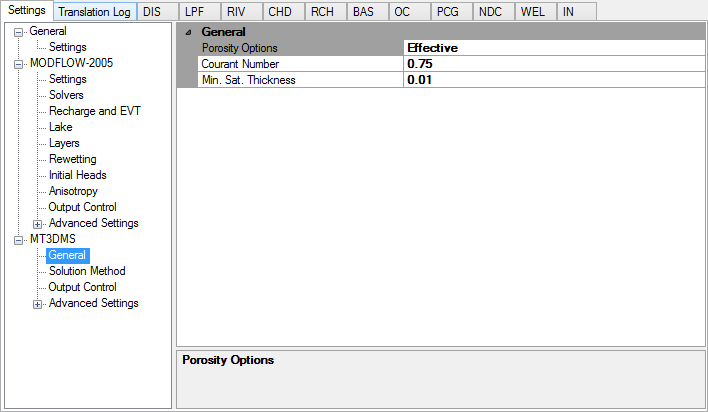 •Move your mouse cursor to specific areas of the interest (such as in the discontinuous aquitard region), and note in the status bar the calculated concentrations for the selected cell. •After 7300 days (20 years) of simulation time it is clear that the plume has migrated to the ‘hole’ in the aquitard. •Advance the times to see the plume migrating the upper layers down to the lower layers. 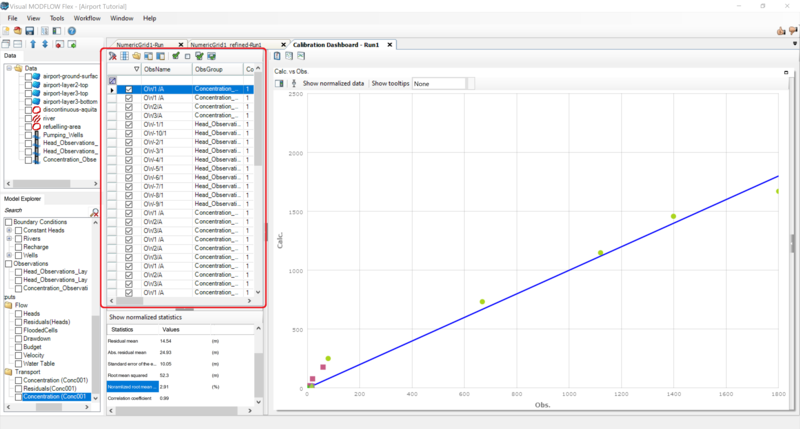 In this section you will learn how to compare the observed concentration data to the concentration values calculated by the model. •Select [View Charts] item from the workflow tree. •You should now be viewing the breakthrough curves for each of the three concentration observation wells defined earlier in the model (see following figure). This time-series graph shows the calculated result using a colored line data series while the observation data is displayed only as data point symbols.